If you have been diagnosed with cystic fibrosis, at some point you will be encouraged to consider a lung transplant for survival. Once you are approved into a program, your journey to, and through, transplant will begin. It's an exhilarating and exhausting time in your life. But well worth it...for the Gift of Life! This design is similar to the one-of-a-kind Jasper Organ Transplant Awareness Bracelet (B165) that was posted during the month of May and sold out within days of it being posted. A stunning handcrafted beaded awareness bracelet was designed to signify awareness of cystic fibrosis as the center of your journey and how your road through transplant will come full circle. 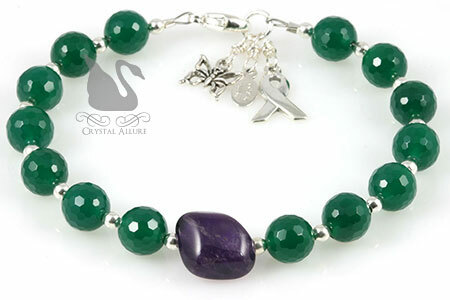 Designed with exquisite faceted green onyx gemstones, a single amethyst gemstone, sterling silver beads, awareness ribbon charm, butterfly charm and our signature jewelry tag. Measures 7-1/2". Green is nationally recognized as the Transplant Awareness ribbon color. October is designated as Healthy Lung Awareness Month. Learn why I added a sterling silver butterfly charm. Read our jewelry article on why the butterfly is a symbol of lung transplant. 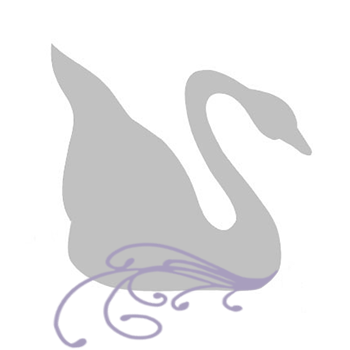 Special Note: Due to the natural amethyst gemstone used in this design, it is a one-of-a-kind.